Many of you missed out on the free Tiny Prints photo cards earlier in the week. I keep posting this great deal and then it expires, so we’ll give it another shot since they are SO CUTE! 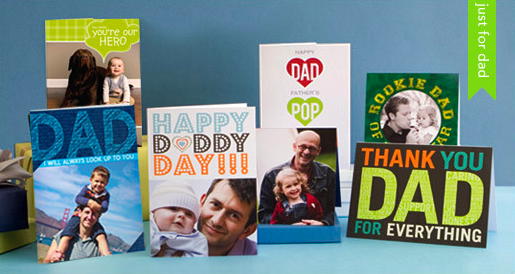 Grab your FREE Personalized Father’s Day Greeting Cards with promo code FREEFD at checkout. I love that you can put in your own photo and add your choice of wording. That makes is such a keepsake. And FINALLY this code will not expire before you read this post! Good for one free Father’s Day card. (6/13). I have heard nothing but rave reviews on how special these cards are, so create yours today. You can add your own pictures, and personalized text to make these extra meaningful. Use this link to snag this great Father’s Day card today only from Tiny Prints. Thank you! I did have to give them a credit card number in order for it to go through but my order amount was zero! Thanks! Great card for my hubby is on it’s way!